Join our newsletter to receive our monthly newsletter with helpful information, tips, announcements. And we will never share your email address or personal information with anyone. 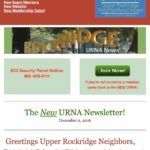 Members of URNA will receive special mailings with Patrol Hours and member-specific announcements. For some other news articles about security and our area, please visit the In The News page.